I bought this partially as a joke for my husband who is anti-modern technology. He loves this. It made him laugh. He took it to work with him and he's got some funny looks when people see him talking on it. It has a good, clear sound and works really well. So much more comfortable than wrestling with a small cell phone. Left on the coffee table, quite a conversation piece. Have purchased three and given them as gifts. I use this product to improve the voice quality of my cell phone and can use it as a corded phone while still portable, just place the cell in my pocket and use the handset like a conventional phone, don't have to cram the cell into my ear to hear properly. Don't know if this unit will work for every cell phone or smart phone, but works well for my LG feature phone. The phone handset is easier on arthritic hands and no more holding a hot phone to your face! I can hold it on my shoulder! I use this so I can hold the phone on my shoulder while keying on my desktop. Can use with cell phone, makes talking much more comfortable,it's great! exposure to the radioactive waves that cell phone have. This is the coolest thing I have seen so I will enjoy this. I am not a fan of the tiny little phones we are forced to choose from when buying cell phones and my job requires me to be on a computer all day. So when I leave work, I do not want to look at an even smaller computer screen. I have a cell phone for talking on (not to text or browse the web) and to hold that tiny little thing for any amount of time is just uncomfortable. This product is exactly what I needed. I can hear clearly and adjust the volume as needed and no one I have spoken to has mentioned any problems hearing me talk. If you have spent time to read all these comments you should go ahead and try it. You will not be disappointed. Makes using a cell phone easier. No distortion with a hearing problem. I use this when I do my bank statement. Or need to do something else and I need both of my hands to be free. Two things 1= I wish the hand set would ring when it is plug into your cell phone. 2= And you can not answer your phone call with the hand set either. *BUT! * You can hang up on someone with the hand set. i love being able to use cell phone as i once did with rotary phones. great to be able to lay cell phone down and sit comfortably and have and easier conversation. This was the second phone handset I purchased. The first one that I purchased from another company did not work well. I was always being told that I could not be heard. This one is truly amazing; the clarity on the line cannot be compared to my previous phone hand set. I love that I can use my phone and keep the world out of my conversation. I love it. It is just like talking on a regular phone. I get tired of the Bluetooth and I am not crazy about holding the cell phone up to my ear. Needed this for so long! I would buy this again and for gifts. I have arthritis in my hands. This actually turns the cell into an easy to hold handset like the older landline phones. I love it plus you can answer the phone from the handset and make it louder or lower. Great invention. I wish the cord was a bit longer but it's fine. This product makes using my cell phone so much easier and when I'm in a long conversation my hand doesn't get tired holding my flip cell phone. I could imagine this would be good for someone to use if they have arthritis, just gives your hand something easier to hold onto vs a slim phone. Great Invention! When your cell is your home phone and you talk for long periods of time it is nice to have a real handset to use. I highly recommend this gadget. I bought this for me and my two daughters. We all love it, with radiation from cell phones, I thought this would make a big difference. I'm now going to buy another one for a friends birthday. I get a lot of comments about my retro phone piece. It is great for holding in your hand, the cell phone gets too hot in your hands when using it for a few minutes. this gives you enough line, so you do not have to hold that hot cell phone by your ear. I purchased this hand held phone headset for a friend that is hard of hearing and has just recently gotten hearing aids. She has found this handset to be a great help in avoiding hitting call ending touches on her smart phone. It has done what I had hoped that it would do for my friend. I do not like my so-called "Smartphone," but I'm stuck with it. I especially do not like the way I have to hold it to my ear to make a phone call. This retro headset is just great. It makes it much easier to speak with someone and have a hand free to do something else, like write something down. Mind you, I only use it at home, but I am very satisfied. Unfortunately, my cats find it fun to play with! I bought this as a gift request for my 13 year old. I find myself using it more than him. Going to buy a second one for myself. Great for all ages, stays plugged in to phone and I don't hang up on anybody anymore. Great for seniors who find it hard using modern technology. I bought this, thinking it probably would not work. But it truly works perfectly. My husband and I are seniors, and we use it every time the cell phone rings. Thank you PS I took a picture of it and sent it to some friends around the country who were surprised that such and "thing" was made, but then I told them how good ours worked. very easy to handle when your cell phone is real bulky. Some time when at a trade show with noise we plug these phones in and all the noise is gone. Would not go to outings without them. The retro phone handset reminds me of the era of partyline. Makes having a conversation on my cellphone a lot easier. It is perfect for me. I have difficulty holding the bulky cell phone through a lengthy conversation, and this item is just right for me. I am using it daily, clear to hear the other party and easy to disconnect or raise the vol up. Everyone that see's it wants one or ask where did I get it. I like to be able to put my cell in my pocket and use the handset, voice quality is much better and don't have to cram a cell phone in your ear to speak or hear. Not sure this device would work on all cell phones or smart phones, but works well on my LG feature phone. This is finally the answer to my husband being able to hear on his cell phone! I am impressed to say the least! Happy with product and your service. Retro phone handsets, ordered for older son and daughter for X-Mas. They were throughly happy with gift. I really like this handset..It's much easier for me to talk on my cell phone now. The cord is short,but over a period of time of using it will stretch eventually. I ordered two black handsets,one for my husband and one for myself. They are everything I hoped they would be. Clear and so much easier to hold when having a long conversation. I am very pleased with purchase. I can't say anything negative about handset. I cant stand long talks on a cell phone, oh and when your put on hold it drives me crazy. this is great. This I can put on my shoulder which is not so easy with a cell phone. I love its yellow color! This does not fit my phone, I should have checked this out fully before ordering, but it fits my husband's phone. Will have to check it out in the car. I bought this for a gift. I don't know if it works. PLEASE DO YOURSELVES A FAVOR... DO YOUR HOMEWORK. ABOUT THE SIZE OF YOUR HEADPHONE JACK . SOME EVEN HAVE EARPHONES IN THE BOX THEY COME. MY SAMSUNG GALAXY TaB 3 CAME WITH THE SAME EARPHONES. YES THEY ARE 3.5mm. Highly recommend this for any cell phone user. The receiver is ideal to use, esp. if you're going to be on your cell phone for any length of time. The receiver is so much more comfortable and easier to hold to your ear than a cell phone. Also, I feel safer having the receiver next to my head than the phone itself. If you are still using a flip phone without a speaker this will come in handy. Sometimes you need to write something down while on the cell phone, This will free your hands. I have trouble hearing and being heard on my cell phone. This eliminates the problem! Although two of my friends have said that I sound like I'm talking from the bottom of a bucket, the rest said that they heard me quite clearly. I bought the ugly purple one because it was cheaper than the other colors and since it doesn't sit out where people can see it, the color didn't really matter so I went for cheap! I really like this handset! It is fun to use, and is clear on my end and the listener's end. I have a Samsung Galaxy S3 and the handset works fine with it. I may need a larger purse to make it fit inside though, but other than that it is neat. I love anything retro, and I especially like the fact that I now don't need my phone at my ear. That is so unsafe. (Ex. I quit carrying it in my pocket because it caused hip pain. )I have already shared a photo of my handset on Facebook and hope others will try one for themselves. It is a nice alternative to a cell phone at your ear. I wish the red light would come on when someone is calling in. That's the only con I see with this handset. Hopefully the company will make that a working feature in the future. For the old cellular phone I have, it's nice not to have the tiny phone on my ear when my calls are more than a minute. It is just like holding a regular phone. at first everyone told me that it sounded like i was in a tunnel. so i took the head set apart. drill the plastic plugs out to get to the screws. and i drilled out the single pinhole in the microphone end. drill it out to the size of the microphone under the plastic, about 3/8 hole. after that everyone said it sounded fine. i tried to send it back for a refund, but i was over the limit. so it sat in my garage for months. then i decided to modify it. the company should fix the problem ...... it had a lot of reviews on this problem. easier to talk on phone..
Bought for my elderly mother!! Mom has a cell phone but she would cut me off when pressing it to her ear to hear me. Hope this will take care of the problem. Christmas gift but I will recommend because it is an unusual item for an unusual problem and priced right. When I go for walks, I can put my cell in my little shoulder bag, tuck the phone under my ear like I did many years ago as a teenager, and talk those miles away in a hurry. Good sound, convenient, and just plain fun. Therefore, this is FUNctional, and it's a good price on this site. I did read that someone had a bad experience with this, so I took a chance. Miles Kimball should just remove this item from their catalog. I must say that custormer service was WONDERFUL. I paid by PayPal, and was refunded within days. I cut the cord off and gave it to my daughter to take to the kids at the daycare center she works in. Cheaply made. Still looking for something to keep the cell phone away from my head. Some day we will find out that people are getting brain cancer from the electromagnetic waves. I bought myself one and a friend one because we live in areas where mobile service is limited. We both have to leave the mobile phone in the window to get a signal. 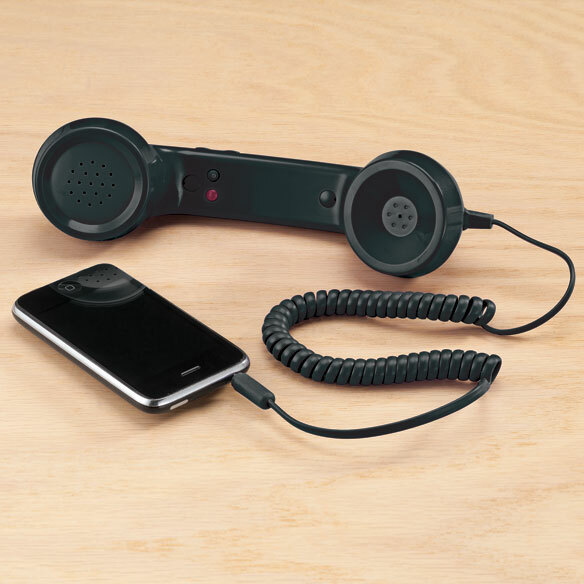 I though this would make it easier to talk, but with the cord being wound so tight it doesn't stretch enough to get more then a foot from the phone and I can do that with speaker phone. For me...this product is useless. I cannot hear on my husbands cell phone, therefore seen this product and gave it a try, it did not work as the plug in was not compatible to either of our cell phones. The Retro Phone Handset lower's the volume of the conversation! The Retro Handset lower's the volume of the conversation, it works, and it makes a good gift to give to friends and family! It's ok...I thought I would hear better....not terrible...not great just ok. It does the job. I could not hear clear using the handset. Others may can hear clear with them. So I am not going to down grade them cause they do what they are made to do. This looked like the perfect solution for me. My hand cramps when holding the cell phone after a while. When I use a regular corded phone however, I cradle the handset on my shoulder while talking. That way I can type or take notes etc... When I attempted to "cradle" this phone, it would NOT stay put - it slipped right off my shoulder. The plastic this is composed of is just very smooth and slippery, plus it is very lightweight. Typical handsets are heavier and stay "cradled" more easily. Great idea, but the sound quality was terrible, the cord too short which made it awkward to use and the receiver was so light it wouldn't rest on my shoulder. Excellent Idea and no complaints on reception but I didn't realize that the cord is too short for walking around while talking on your cell phone. Unfortunately the cell phone just dangles and the cord is just shy of allowing me to comfortably put my cell in my pocket while walking around. IF you plan to sit in one place and talk on your cell, by all means I see no reason NOT to buy it. I just wish they would have given more thought and added a few inches to the cord and it could serve both purposes. Can't hear party on line. Too much static. The phone attachment was not what I expected. I tried using it and when I would try to talk to people on the phone they said they could hardly hear me. It was all static. No use ddn't work with my phone kept getting bad reception and alot of electrical crackling interference. Too bad, I was excited to get this! Good Idea, But. . . The plug on this does not fit an I-phone 6! Maybe I can find an adapter? It was okay. It was insulting to have to pay a handling fee on items that shipped "free." I tried the headset out by calling my son who was across town. He could not hear me and when he talked, there was a lot of static. When I called my husband who was in anothet room at home, it was a clear reception. Gave as a gift; didn't fit his phone. If this handset only fits smartphones, the description should stipulate that. Even though the gift didn't work out, the phone itself is very pretty. It did not fit my phone. The good thing is it worked for my family members phone but didn't work for mine. Very disappointing. I had hoped to use this as an aid for my elderly mother, but it does not work. I have tried several ways to use it, and also to modify my phone, but it does not work. My phone is just an Apple iPhone, so it is nothing fancy---will be returning it. People on other end of phone call complained of noise and not so good connection, tells me it's a flimsy item not well made. I tried this on 3 different cellphones, it did not work on any of them, I will be returning it. I will not recommend this item. I tried using the handset on several phones to no avail! I plugged it into a radio phone jack and it acts like a speaker. the little light do not come on at all! I thought it would be great to use for my conference calls, but it didn't work like I thought it would. Disappointed but that was the risk I took when I bought it. Sorry Miles Kimball, this was a disappointing purchase. This phone would only work one way, I could hear the person talking but they could not hear me. Wish I would have read the reviews before I wasted my time and money on this product. Looking at the reviews, and the majority are bad, why do you keep selling this product? This product wasn't totally funtional. I was very disappointed with this item! The headset is very lightweight and delicate however; the cord was stiff and tangled plus the adapter would not stay connected to my iPhone; it kept popping out. I will be returning this. Not happy. Speaker cheap,cheap,cheap! Can not hear with it. I ordered this for my Aunt. She is elderly and it would be easier for her to hold. Holding it was perfect. To bad you can not HEAR it! When attached to my cell phone the people I would talk to tell me they could not understand me. It made my call sound mumbled. Wouldn't recommend this to an enemy let alone a friend. Things that aren't so great about it! I bought this so that I could use my touch phone when making phone calls. It worked fine, for all of 5 mins. When I tried to adjust the volume on it, the button wen INSIDE the handset and I couldn't get it back out. There is no way of opening the item to be able to correct it. So, I now have a USELESS piece of junk sitting here, as it's not worth the hassle of sending it back. I would not buy this again . It did not work on my phone , but who knows , it might work on a different modal .Customer service was very kind and put a credit for the full amount on my account . The product is well made, however, it does not work on any of my phones. Not cost effective to return item. Perhaps it is why the price was reduced. I think it is good to have the transmicrowaves away from my head. To help my brother hear his phone. it allows me to talk on a handset. For my 82 year old mother who has a problem with hearing on her cell phone. Thought this would help. I like to be able to hear and talk on my cell, since it is the only phone I have. This will make it easier. I purchase this handset for my mom for Mother's Day. She loved it!! She can hear the person on the other end clearly with no static. No more hand cramps holding her cell to her ear. After seeing how the handset works and the great review she had, thought I would order one for a friend and one for myself. Seems easy to use and prevents radiation from cellular phone. I chose this handset because my phone can shut off with the slightest touch of my cheek. That is very irritating when I am in the middle of speaking and the phone turns off. I chose this so it would be easier to do 2 things at once while on the phone. I am an old lady and I like the old phones. Thought this would be a good joke as well as being able to hear better with it. This item should help with talking on my cell phone on calls that take more that a few minutes. For my Mom when using cell at home. Phone slips and hand cramps. Adaptive aide for 91 years young woman who has difficulty with her hands. For a musical production and they are perfect! To hold my cellphone while talking, keeping my hands free. I Wanted it to remind me of my past. My husband is completely blind...he finds using the cell phone (which is our principle phone) with the side buttons and square shape hard to comfortably use. so I decided to try this as it will fit in his hand (and mine too).better. I am really looking forward to receiving this. My husband needs a regular phone to talk on and we do have a cell phone but my husband doesn't use it because it doesn't have the handset. Decided to buy it and he can try that with our cellphone. For an elderly woman that can't get the hang of a smartphone. Thought my 81 year old mother would get a kick out of this for her phone. To help my elderly dad deal with his cell phone better. He hits buttons and hangs up on people by accident. Hopefully this will help. Decided to get one for everyone. I can rest the phone on my shoulder, and type with both hands. Would prefer to talk on a cell phone the way I used to talk on phones before cell phones were invented. Does the phone jack fit smart phones? How does it work? No instructions came with it. I plugged it into my cell phone and attempted to make a call. I could not hear the other person. I hit the volume control to raise it, but nothing happened. BEST ANSWER: Thank you for your question. You just plug this item into the headphone jack on your cellphone. This item features a answer button and volume control. We hope this information will be of help to you. does it just fit smart phones or most all cell phones? BEST ANSWER: Thank you for your question. 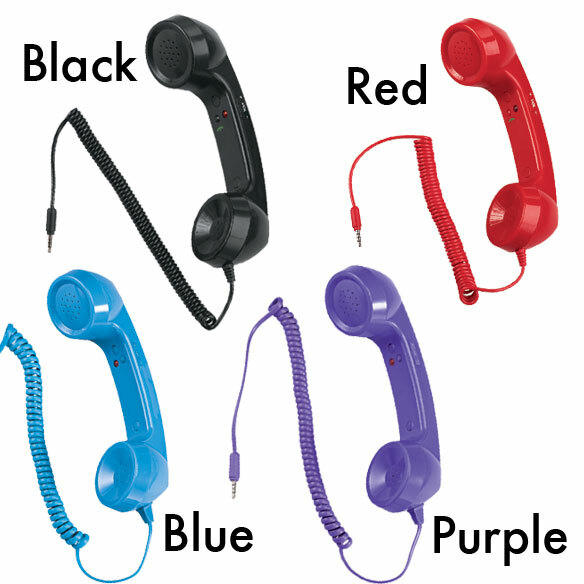 The Retro Phone Handset will work with any mobile phone that has a 3.5mm jack. We hope this information will be of help to you. There are two buttons on the inside of the headset one is red that is fixed and wont go up or down/the other is BLACK and the button will allow you to push it down. What they the buttons for? BEST ANSWER: One is ON/OFF for the handset. The other is to MUTE the microphone. my 'phone' is coral, one coral button disconnects the call, the red button I can only guess that it would light up if the battery is low? Does this fit into lg3phone.? BEST ANSWER: Thank you for your question. This item fits into a standard (3.5mm) headphone jack. We hope this information will be of help to you. Would love to order this, but I have a phone with the flat jack, how do I get this to work? My phone is a Samsung Rugby II. BEST ANSWER: Thank you for your question. 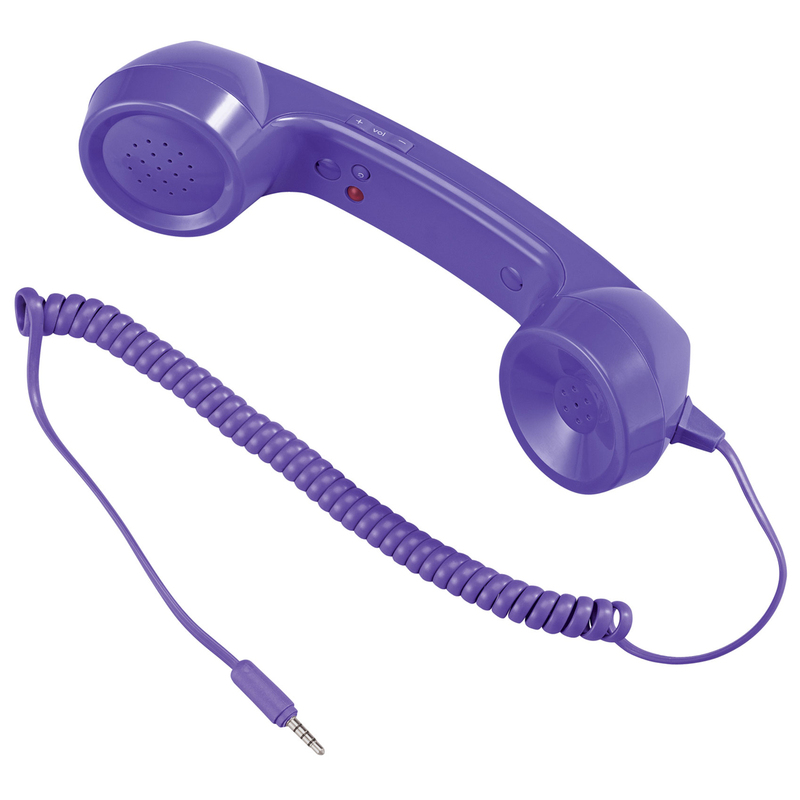 The Retro Phone Handset is designed for a 3.5mm headphone jack. If you have a different headphone jack there are adapters available. We hope this information will be of help to you. BEST ANSWER: Thank you for your question. Unfortunately no, we do not offer this item in pink. Only the colors shown on the website are available. We hope this information will be of help to you. how dose the volume work?, my seems to do nothing. BEST ANSWER: Thank you for your question. There is a volume control, but it is located on the side of the phone. It is more of a piece you slide up and down, rather than a button. We hope this information will be of help to you. You increase the volume from your cell phone. does this fit all cell phones? BEST ANSWER: Thank you for your question. 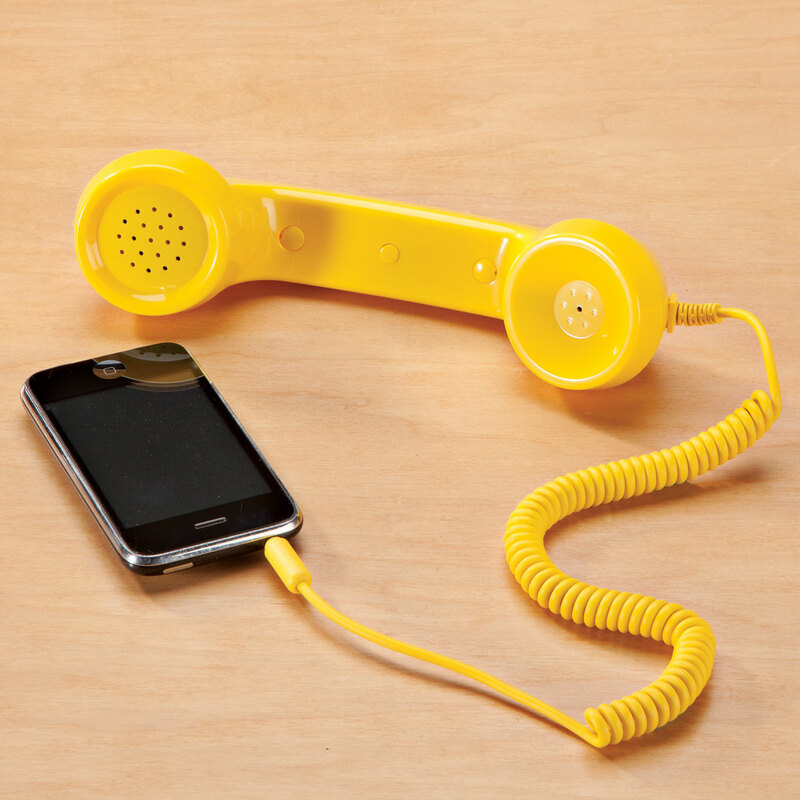 The Retro Phone Handset will fit phones that fits the mobile standard headphone jack 3.5mm. We hope this information will be of help to you. does this work in the car? BEST ANSWER: Yes, it'll work anywhere you have reception & has great sound. Not sure - it doesn't even fit into my cell phone unit so I am not sure if it works anywhere. Is this compatible with an IPhone 8? BEST ANSWER: Thank you for your question. Yes it can be used with the iPhone 8 but you will need an adapter from Apple to use it with your phone. We hope this information will be of help to you. I have an IPhone 6 so I'm not really sure. The phone handset has a long round plug to go into the IPhone. If the IPhone 8 has this feature it should work. Hope this helps. I don’t have iPhone 8 but you need a headphone jack to connect this gadget in and I believe iPhone 8 doesn’t have a headphone port. I believe it would. The plug is just like a headphone plug, so it should work. BEST ANSWER: its a coiled cord that stretches to about 6 feet but if u did stretch it that far i am sure it would unplug. i really love this device, it feels like I'm holding a real phone. only long enough to put in your pocket maybe and walk around - long enough to put on high table or counter top to talk while sitting. Coiled up its about 1 1/2 ft. Extended about 1 1/2 yards. is the 3.5mm jack flat? BEST ANSWER: No, it is round. Pic is like my Apple cell and the hook up round hole is at the top of the phone. Works great! Do these handsets work on a Samsung Galaxy S4 phone? I am currently using a Micro USB charger. Is that equivalent to a 3.5 mm jack? BEST ANSWER: Wound up tossing this...bad connection, poor sound quality, I wouldn't recommend it. Thought it would be a nice extension to my cell phone (it fits into the earbud port) but that wasn't the case. Thank you for your question. A Micro USB is not the equivalent to a 3.5 mm jack. The 3.5 mm jack is where you plug headphones into. We hope this information will be of help to you. Does this handset work with verizon flip phone? BEST ANSWER: Thank you for your question. It will work on any standard 3.5 mm headphone jack. We hope this information will be of help to you. I have a Samsung Galaxy phone with a flat head. Does the handset come with adaptors? BEST ANSWER: Thank you for your question. No, it uses a round head only. We hope this information will be of help to you. will this fit iphone plug? BEST ANSWER: Thank you for your question. It has a round adapter, we do not think this will work for an IPhone. We hope this information will be of help to you. will this work on a net10 phone? BEST ANSWER: Thank you for your question. This will work with any phone that has the standard headphone jack. We hope this information will be of help to you. can you use this with a regular home landline phone? BEST ANSWER: Thank you for your question. No, this is intended for smartphones that have a plug in for headphones. We hope this information will be of help to you. are there any that fit an I phone 6? BEST ANSWER: Thank you for your question. It will fit phones that have a 3.5 mm headphone jack.We hope this information will be of help to you. will it work for an IPhone 4S ? BEST ANSWER: Thank you for your question. This will work with any phone with a 3.5 mm head jack. We hope this information will be of help to you. Does the retro phone headset work with a phone that uses a micro USB charger? BEST ANSWER: Thank you for your question. A Micro USB is not the equivalent to a 3.5 mm jack. The 3.5 mm jack is where you plug headphones into. We hope this information will be of help to you. does the retro phone ONLY work with smart phones or can it also be used with a iPod that has been set up to make phone calls? BEST ANSWER: Thank you for your question. 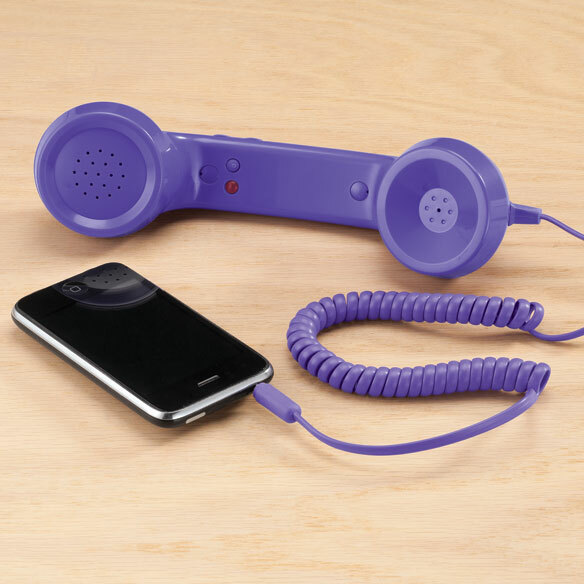 The Retro Phone Handset will work with a device that has the standard 3.5mm headphone jack. We hope this information will be of help to you.